The setup for LEGO Star Wars II: The Original Trilogy is fairly simple. The small downside it that you must either have a saved game or you have to start a new game and save it in one of the three game save slots first. The upside is that the setup of the game is otherwise very simple. Once you get to the multiplayer (see "Menus & Navigation" below), the menu options are simple, worded well, and easy to follow. There are lots of options you can choose from (2 locations, 5 game types, and many durations, not to mention 9 unlockable bounty hunters). The game also gives you a countdown progress display while the game is being downloaded (yay!). The biggest problem with the Single-Card Download features in this game (but not the biggest problem with the game overall - see "Overall Fun" below) is that the game doesn't make it obvious how the Single-Card Download function is accessed (the same is true about the Multi-Card Play). First, you have to enter a previously saved game. If you don't have one, you have to start a game, then save it. Then you have to walk through the Cantina, through a doorway, up a ramp into another room, and then read an unlabeled pedestal. Then you're given your multiplayer options. From that point on, everything is simple and well explained, but be careful where you tap (the tap-able zones are VERY close together). Once you're finally in the game, things run surprisingly smooth (especially compared to the main game). Control is above average and precise. The game reacts by doing what you tell it to do. The controls are intellegently designed to be natural. The touch-screen isn't used much, but for this type of game it works. Just remember, even if you unlock Lando Jabba's Palace, DON'T USE HIM!!! Every time I tried to use him and make him jump, the game froze and both systems needed to be rebooted (a couple times I had to jump a second or third time, but it still happened every time). It's a programming bug. LEGO Star Wars II: The Original Trilogy has one of the best Single-Card Download offerings to date. While the title is extremely glitchy (which I've addressed in every other section of this review), the Single-Card Download content is, without a doubt, the best (and most reliable! - just don't use Lando Jabba's Palace) portion of the game. The deathmatch options are numerous (133 different combinations, if you include every possible duration). The look is beautiful, while a bit blocky (unintentionally and intentionally) and the sound is crisp and appropriate. For LEGO Star Wars II: The Original Trilogy, this category is far more subjective than for most games, so I'll address the bad, then the good. The bad is that this may be the most glitchy game ever released for the DS. In the main game, certain characters and ships are unlockable because of bad programming and sometimes the camera will get stuck in place so that, as you get further away, you just get smaller and smaller. In the Single-Card Download, the duration options are inconsistant and DON'T USE LANDO JABBA'S PALACE. Now that the bad is out of the way, when it comes to the Single-Card Download content (which is exclusive to the Nintendo DS version of the game, as are the glitches), it seems like every little bit of thought, care, and patience put into the title went into the Single-Card Download content. The deathmatches are great. Most of the glitches are in the main game only. All of the bounty hunters are unlockable. I've actually held this game up as an example of what great Single-Card Download features are like to play. Yes, each game CAN go too fast or CAN last too long. You just need to choose your duration based on how the players will be playing. It's too bad the rest of the game isn't up to the same standard. If only they would release a DS accesory to go in Slot-2 (GBA Slot) that would patch in to the game and correct the glitched, I'd spend a few bucks for shipping in order to get it. I've played the game with people new to the Nintendo DS, and they enjoy it, and I'll continue to do so in the future. I honestly think they'd have done better by splitting this title into the main game port and a separate deathmatch title. Oh yeah. I almost forgot. No glitches. 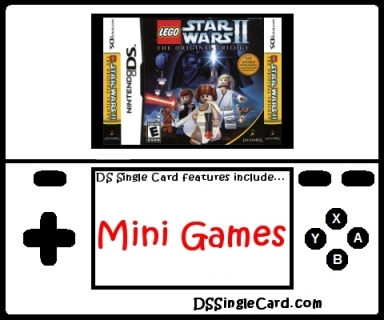 Click here to return to the DSSingleCard.com LEGO Star Wars II: The Original Trilogy profile.